Well done to everyone who participated in yesterdays final leg of the NW Spring League, the event was well attended by all clubs and the lovely sunny weather added to the enjoyment of the day. In the Primary Class, Eamon & ‘Dreamer’ unfortunately had 3 poles down but still managed a respectable 3rd place early on in the day, with his previous weeks victories he still retained 1st place in the overall League- well done Eamon !!! Next up was the Advanced Primary Class, with only 3 double clears on the day it was club chairman Lawrence & ‘Jennys Jigsaw’ who claimed 1st place, Letterkenny’s Liz Cuffe took 2nd, closely followed by team mate Enda McClafferty. Liz Potter & Paul Curran both had an unlucky pole down leaving them with 4th & 5th placings. Ryan decided to do a little schooling on Rudy’s horse ‘My Boy Boysie’ in this class & had a beautiful double clear very close to the optimum time, unfortunately Ryan had chosen his loyal ploughing companion ‘King Bud’ as his nominated horse and so was un-placed in the competition. Overall in the League, Lawrence was placed 2nd, closely followed by Liz Potter in 3rd , and Paul Curran in 4th. The mixed pairs novelty class was run over a challenging 11 fence course, with plenty of twists & turns to add to the complication !!! Lawrence & Paul kicked of the class, unfortunately Paul & ‘Banshee Lady’ seemed to have serious sat-nav problems after he cleared the 1st jump, leaving them on a very slow time of 210 seconds with 3 poles down. Liz & ‘Clyde’ were next to take up the challenge & had a perfect clear round in a great time of 70 seconds, Ryan & ‘King Bud’ were slightly slower & had 3 poles down leaving them on an overall time of 178 seconds & 1st Place in the Novelty Class. It was the ever consisent ‘Flying Dutchman’ Rudy & ‘My Boy Boysie’ who claimed a very well deserved victory in the hotly contested Intermediate Class, with consistent high placings throughout the league this left them in an overall joint 2nd place. 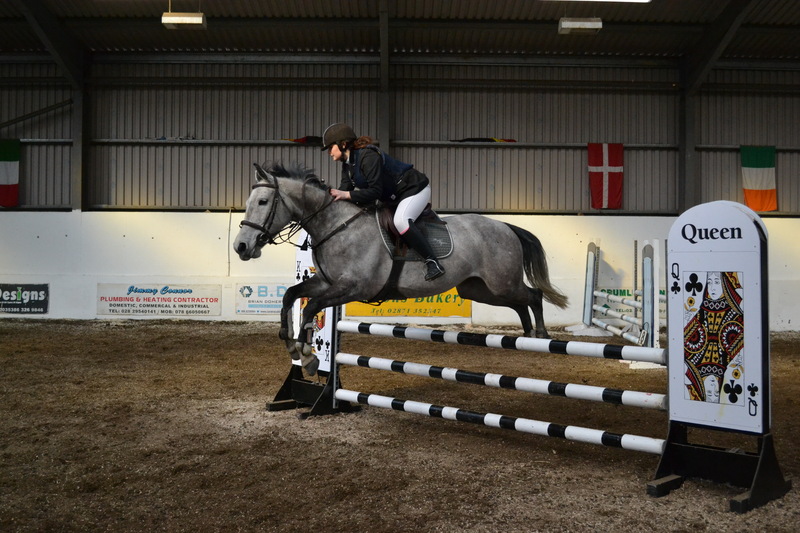 Carla & her beautiful mare ‘Action’ also made it into the jump-off but had an unlucky 2 poles down, leaving her with 3rd place, and an overall league placing of 4th. Roseleen McGinley was the fastest 4 faults round and received 6th place leaving her in a very respectable overall league placing of 5th, well done to Roseleen & ‘Lacoda’ on their first intermediate level league. The last class of the day was the Advanced Intermediate, Rosaleen Harkin & ‘Santa Cruise Lady’ had a lovely clear round taking them in to their first ever advanced intermediate jump-off. With only 4 making it into the jump off, they had another effortless clear round leaving them in 2nd place just 4 seconds behind the winner Claire Cuffe of Letterkenny RC. 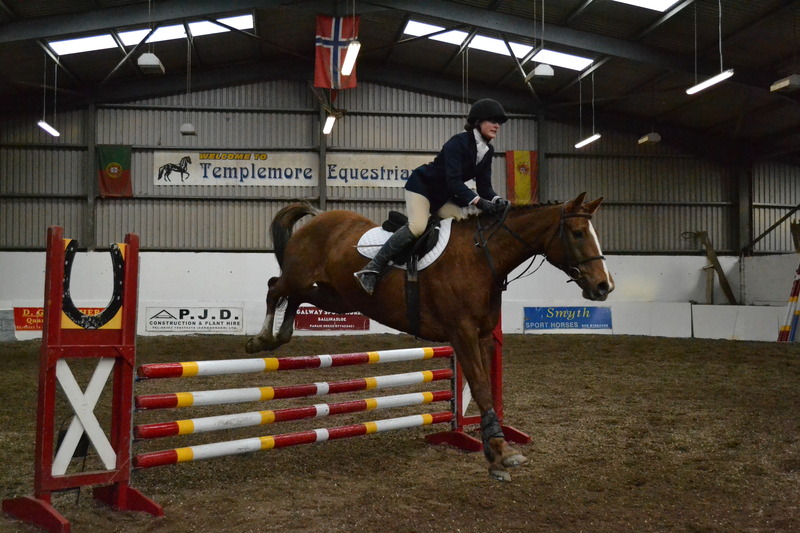 Fellow team-mate Emily Schneider & ‘Ray Lady’ also made it into the jump off & showed us all how to cut those corners in the fastest time of 39 seconds, unfortunately they had 2 poles down and took 4th place. 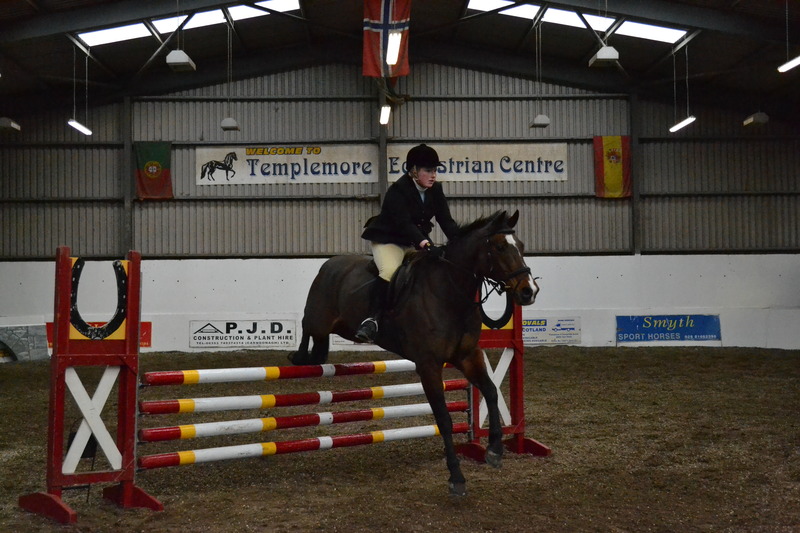 Patricia & ‘Dandy’ failed to make it into this weeks jump off but received 4th place in the overall league,with Rosaleen in 5th & Emily in 6th, well done ladies !!! 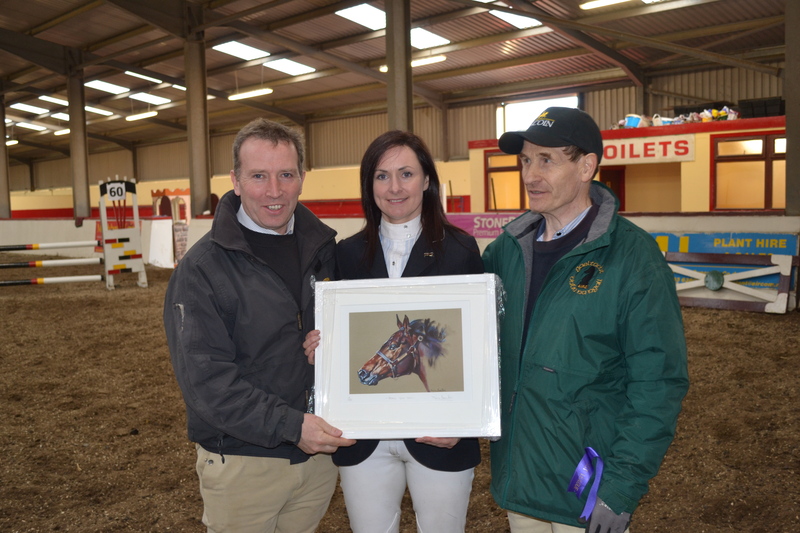 There was a grand total of €750.00 raised at the show for the ‘AWARE’ charity , Cecil & Tanya were presented with a cheque on behalf of the riding clubs involved. There was also a raffle held for a beautiful painting by Marina Hamilton, club member Rosaleen Harkin was the lucky winner and now faces the tough decision of where to hang this unique painting in her home. Thank you to everyone involved in running this League, to the riders who turned up to participate, the helpers who picked up poles , Mona who sorted the prizes/rosettes, Judges Patricia, Cormac & Jacqueline, course builder Seamus & everyone else who make it the success it is.